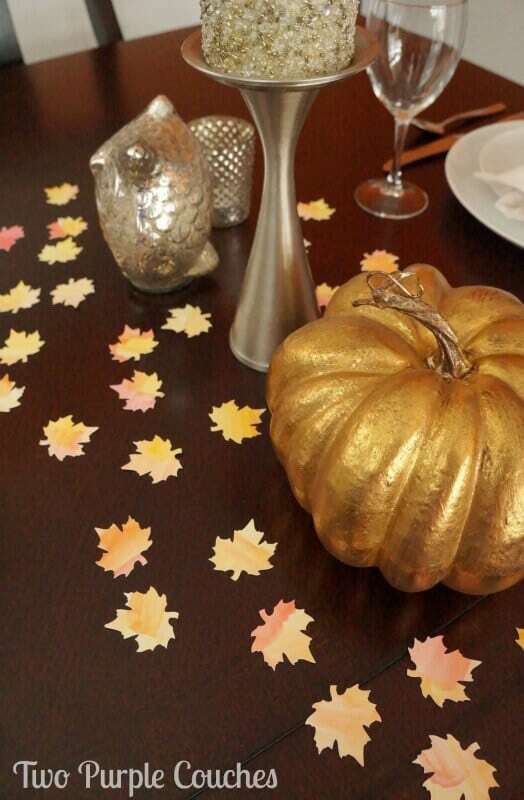 I love to set a fancied up table for Thanksgiving. It's one of those times of year that I am not worried about the number of dishes it adds to the evening's clean up, I don't care about the extra time it takes to make it look oh-so-pretty (in fact, I relish that time! ), and I believe the extra effort makes the meal taste even better! 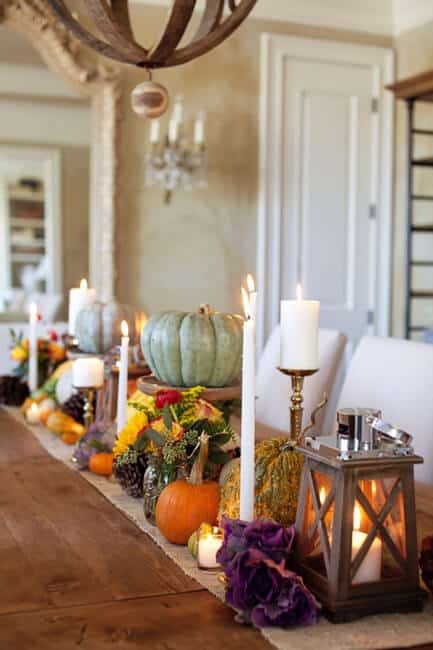 If you too would like to kick your table up a notch this year- here are 10 fantastic Thanksgiving table ideas! Last year, I added a long plank to our tabletop that had once served as a shelf somewhere in the house- and I covered the board with sugar pumpkins, artificial leaves This is an affiliate link: MomOf6 earns a commission if you purchase, at no additional cost to you. 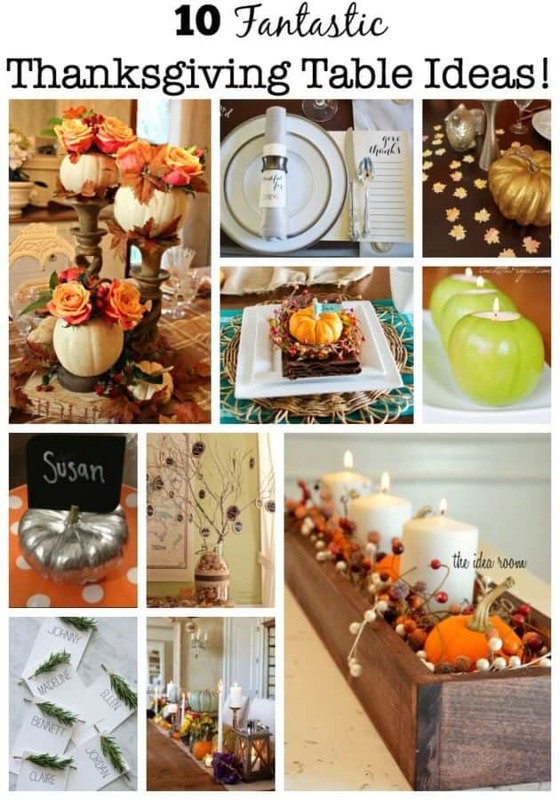 , vases of pinecones, and lots of candles. One of my favorite touches was creating these mason jar photo centerpieces! 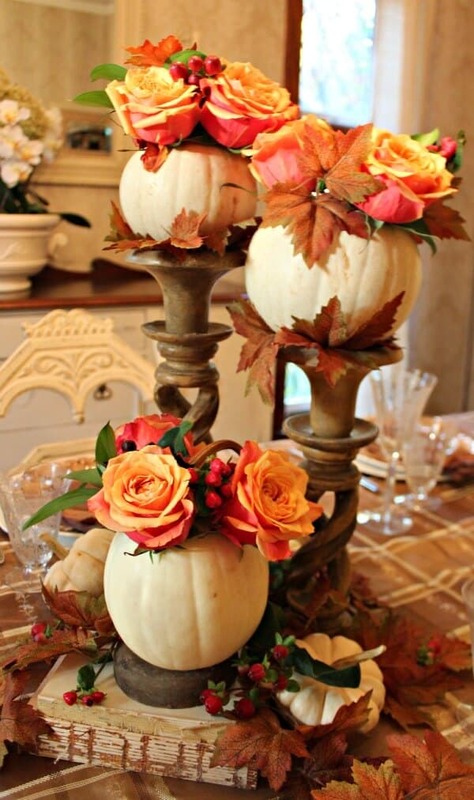 I never know quite how to bring together a tall centerpiece for the table, and I think this one using tall candlesticks This is an affiliate link: MomOf6 earns a commission if you purchase, at no additional cost to you. and even old books to give some height and covering the base with faux leaves This is an affiliate link: MomOf6 earns a commission if you purchase, at no additional cost to you. and berries is awesome. And the white pumpkins with fresh roses makes it all look like a pro pulled it together! Courtesy of New House New Home. 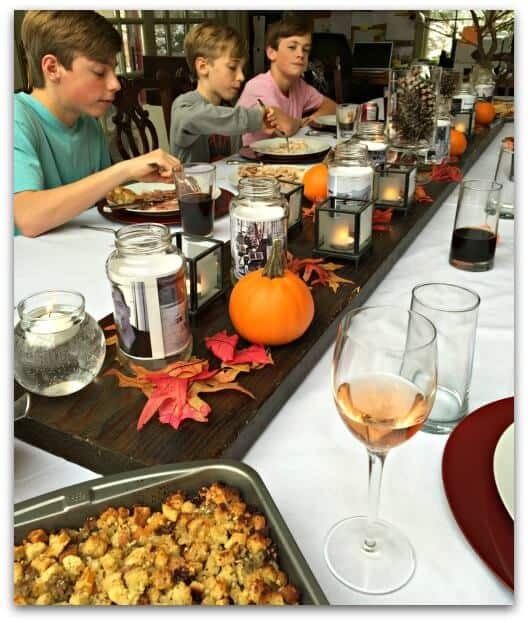 I love the use of pillar candles This is an affiliate link: MomOf6 earns a commission if you purchase, at no additional cost to you. as well as candlesticks and elevated pumpkins in this gorgeous centerpiece as featured on LoveLucyGirl (link no longer available). 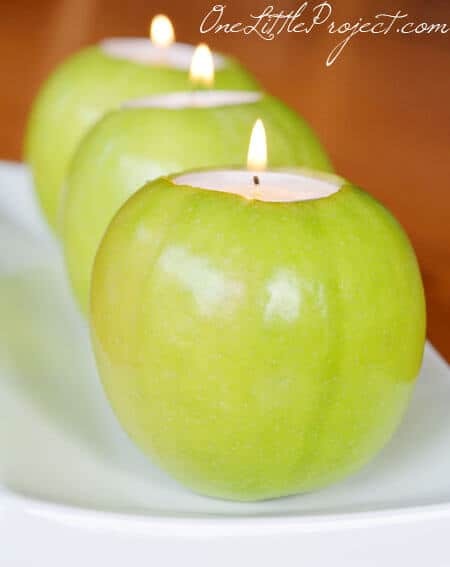 I love the simple idea of carving a hole in the top of an apple and adding a tealight This is an affiliate link: MomOf6 earns a commission if you purchase, at no additional cost to you. , like the apples featured here on One Little Project. I love table confetti– and this project involving watercolors and a silhouette paper cutting machine This is an affiliate link: MomOf6 earns a commission if you purchase, at no additional cost to you. is awesome! Courtesy of Two Purple Couches. 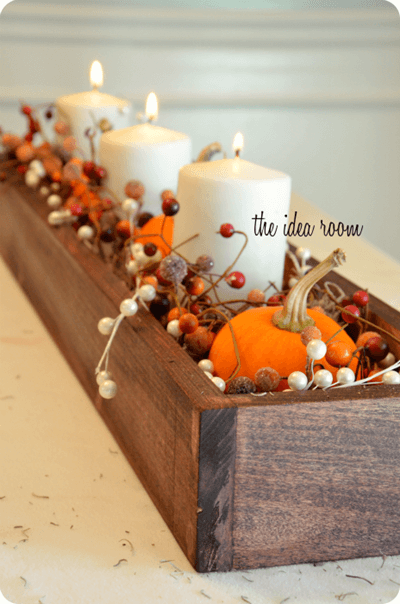 I so want to make this simple wooden box to use as a centerpiece for our table! Courtesy of The Idea Room. But maybe I'll just buy this one on Etsy instead! 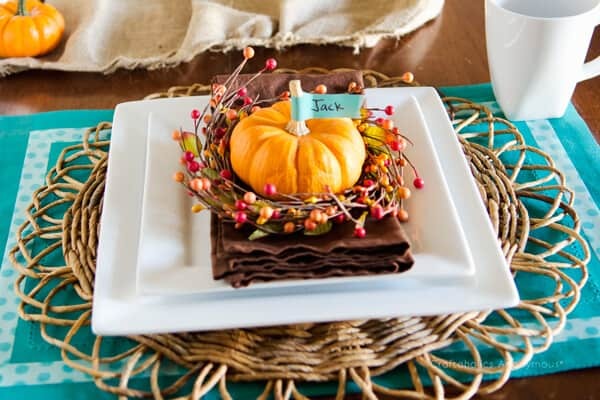 Beyond just the use of color (I love how the turquoise pops against the orange), I also love the way that Linda from Craftaholics Anonymous layers her place setting. Cloth placemat This is an affiliate link: MomOf6 earns a commission if you purchase, at no additional cost to you. , wicker charger This is an affiliate link: MomOf6 earns a commission if you purchase, at no additional cost to you. , two different size square plates This is an affiliate link: MomOf6 earns a commission if you purchase, at no additional cost to you. , brown linen napkins This is an affiliate link: MomOf6 earns a commission if you purchase, at no additional cost to you. 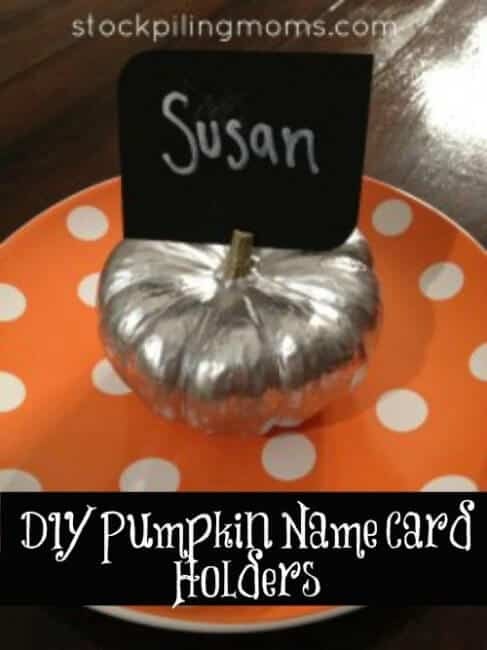 , and gourd place card. So beautiful! 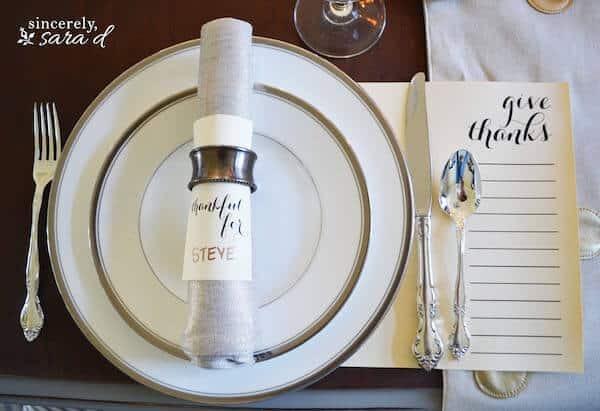 I love the simplicity and elegance of these free printable Give Thanks placemats and Thankful For place cards (and love for she inserted them in the napkin rings) from Unexpected Elegance. These silver pumpkins as place card holders are adorable. Full instructions over at Stockpiling Moms. (Or you can purchase similar ones here This is an affiliate link: MomOf6 earns a commission if you purchase, at no additional cost to you. ). 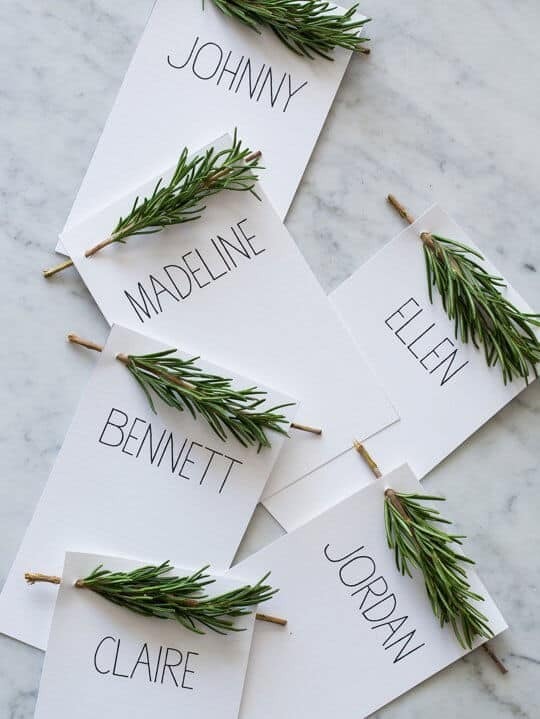 We still have rosemary growing in our garden-and using them in these sweet yet simple rosemary place cards is a great idea! Courtesy of The Kitchn. Last year I was inspired by this Thankful Tree I saw over on Simply Vintage Girl- and while I absolutely love her wooden chalkboard tags, I wanted to be able to write more than a few words on our tags. 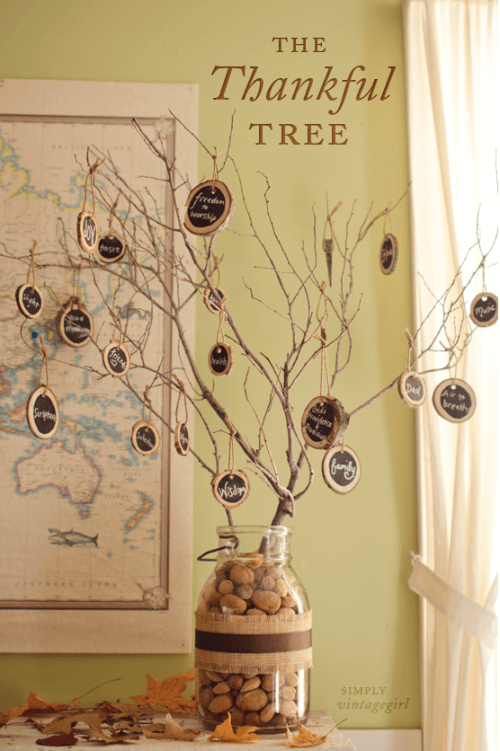 So I created paper tags using scrapbook paper that gave us more room to write and hung them from a branch that we found in our yard. Are you feeling inspired to create your own beautiful tablescape this Thanksgiving? « 10 Delicious Thanksgiving Side Dishes! 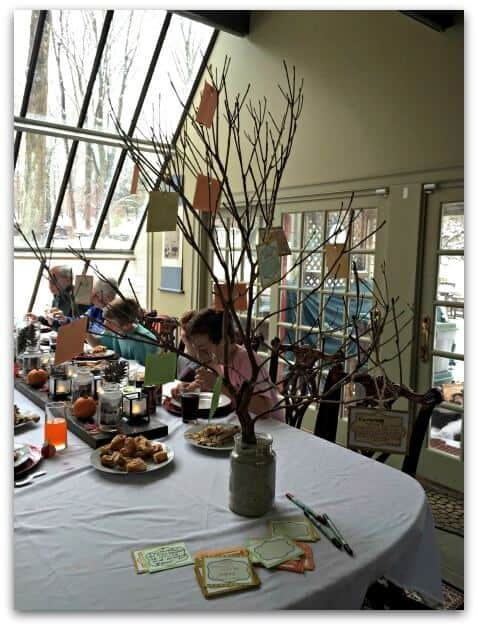 Thank you for including my table confetti! You’ve included some wonderful ideas here! I love finding great new ideas like yours! Happy Thanksgiving!